Facts About Eagle Eyesight: What Is Eagle Vision And How Do Hawkeye See? Eagle Eyesight: How Do HawkEye See? Eagle eyesight always fascinates me. See how Hawkeye massacres every freaking flying objects in “The Avengers’’? He misses nothing! For a nearsighted person like me, good eyesight is deeply treasured. Have you ever wonder how the world will look like if you have eagle eyes? According to scientists, you will be able to see what is your girlfriend writing on her Iphone on the ground from the roof of a 10th storey building. Let's learn more about eagle vision. 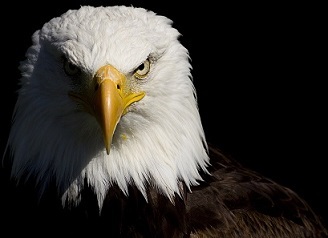 Despite its small body frame of no more than 14 pounds (6.35kg), the eagle eyes actually weighed as much as human eyes. While human eyes take up 5 percent of the head, eagle eyes occupy 50 percent! The shape of an eagle eye is also much different from that of us. The back of the eagle eye is flatter and bigger, allowing a larger image to be formed. Similar to dogs and cats, they have two eyelids. Other than the standard sleep-shut-eyelid, eagles have a special inner eyelid called nictitating membrane. This eyelid blinks every 4 to 5 seconds and helps to lubricate the eyes and wipe off dust and particles from the cornea. Eagle vision can reach up 4 to 5 times further than a person with perfect vision. A perfect eyesight for human is standardized at 20/20 but an eagle eyesight has a visual acuity of 20/4, meaning that what you can see clearly at 20 feet, an eagle can see it with the same crystal clearness at 100 feet away. See how they are able to spot the hare miles away? Firstly, their retinas are more densely coated with light-detecting cells called cones than human retinas, enhancing their power to resolve fine details just as higher pixel density increases the resolving power of cameras. 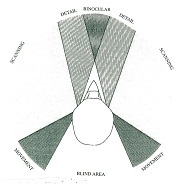 Secondly, they have a much deeper fovea, a cone-rich structure in the backs of the eyes of both humans and eagles that detects light from the center of our visual field. “Our fovea is a little shell or bowl, while in hawk or eagle it's a convex pit. Some investigators think this deep fovea allows their eyes to act like a telephoto lens, giving them extra magnification in the center of their field of view," Hodos in Life's Little Mysteries's interview. Eagle color vision also have an advantage over people in that people see three basic colors whereas eagles see five. Eagle eyes have many sensory cells. PBS notes that humans have 200,000 light-sensitive cells per square millimeter of retina, while eagles leave humans in the dust with about 1 million light-sensitive cells per square millimeter of retina. They see colors as more vivid than we do, can discriminate between more shades, and can also see ultraviolet light — an ability that evolved to help them detect the UV-reflecting urine trails of small prey. Absolutely useful if you have a pet like it at home. On top of the ability to see farther and perceive more colors, they have nearly double the field of view as compared to human. If our eyes are angled 30 degrees away from the midline of our faces like an eagle's, we will be able to see almost all the way to the back of our head with a 340-degree visual field (compared to normal humans' 180 degree field). If you are eagle-eyed, no one will be able to sneak up and jump on you ever again! You rarely see an eagle hunting at night because eagles do not have good night vision. What helps them see more colors during the day hurts them at night. Cones are a part of eyes that help eagles see better and see more colors. Rods are parts of the eye that have to do with receiving light, and eagles have much more cones than rods. Which is why even though they can still see in dark, they can't see as well as they do in daylight. At night they will prefer to stay around their nests and relax as it is too dangerous and inefficient to hunt without their highly sophisticated day vision. Sadly, replacing your eyes with eagle eyes is not an option currently available. Even if you can do a transplant, you will looking totally weird and you will be probably be detained by the Government secret service for experiment. But with eye exercises and optimal eye vitamins, it is possible to achieve 20/20. Though you may not be able to be like Hawkeye, at least you will be able to see better naturally.